Last Monday we arrived from our long passage and have been very busy. One of the last thing that I wanted to do was get my first tattoo. 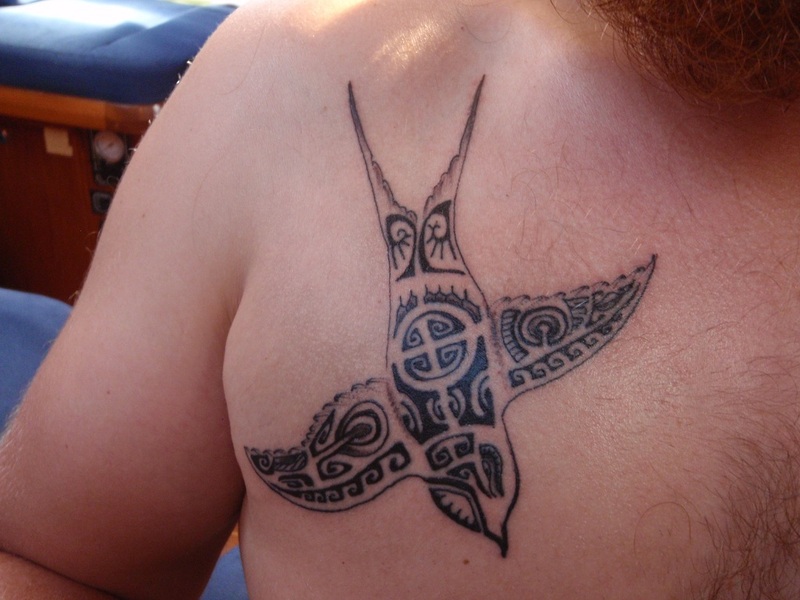 So I got my first Swallow bird, which represents my first 5000 nautical miles sailed. I designed the tattoo with the help of a local artist Franswa. I had the swallow bird filled in the Marquises symbols which mean safe voyage, protection of the sole, power and strength, and the eye that sees and avoids danger. I also had 5 of the same points put into the tattoo which represent 1000 naturals each. I spent 3 days working and design the tattoo and finally yesterday I was happy with the design. I went to the Franswa home were he had a little porch room that over looked the bay and was open to the outside air. He took the design from the paper and free hand designed it on to my skin. I was very worried because I always thought tattoo artist traced there designs on carbon paper and then stuck that to your skin. Not in Marquises, they free hand the design and then free hand the design to your skin. After he finished drawing it on me and I was happy he started the tattoo. I have never gotten a tattoo before and it was very interesting feeling the needle work over my skin. It hurt for the first 20 minutes like a hot knife being dragged along my skin and as time went on I just zoned out and enjoyed the sensations. I listened to my music and the buzz of the needle gun. I watch little lizards crawl across the ceiling and all the rosters outside the porch crow. After 1 hour of work the tattoo was done and I was very happy to have my first Tattoo ever. My plans when I left the states was to get a swallow tattoo for each 5000 nautical miles and so I have 5 more to go. Each tattoo will represent the area of the world I received the ink in. This entry was posted on May 30, 2013 by Jacques. It was filed under Uncategorized . Hope you don’t get one for every special stop on your voyage? so, adam will have a tattoo when? lol! Oops, just read your blog for the day, @ least you have thought about your ventures for a long time and it isn’t just a passing fancy. Wow wait till gramma sees this! We are following your journey daily. Wow, what an adventure.